The 15-inch minimum length on largemouth bass in the Arkansas River will be reduced to 14 inches beginning Jan. 1, 2013. Anglers on the Arkansas River will be able to keep a few more fish next year. 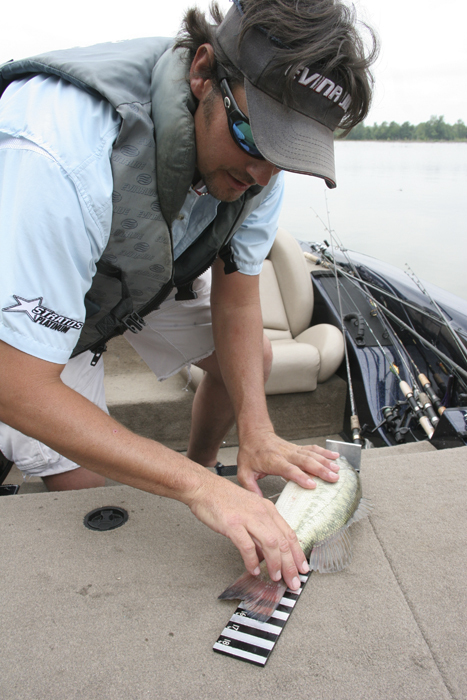 Beginning January 1, 2013, the minimum length limit for largemouth bass on the Arkansas River will be reduced to 14 inches. Fish caught that are less than 14 inches long must be returned to the water immediately. Another change coming Jan. 1 is to allow only cast nets and throw nets for the taking of shad below dams. Hand-held dip nets will not be permitted. Remove Lake Atalanta at Rogers from the Community Fishing Program and make it fishing with rod or pole only with a daily catfish limit of five. Add Mom’s Lake at Corning to the Community Fishing Program. Add Walnut Ridge City Lake to the Community Fishing Program. Allow single barbed hooks for fishing with bait outside the special regulations area of the White River tailwater below Beaver Dam. Allow use of artificial lures with multiple barbless hooks in the special regulations area of the White River tailwater below Beaver Dam. Remove the 13-inch minimum length limit on largemouth bass on the lower Ouachita and Saline rivers in south Arkansas, but keep the minimum length limit inside Felsenthal National Wildlife Refuge. Make Lower White Oak Lake near Camden catch-and-release fishing only. The lake is being renovated and will be restocked with fish after it begins to fill again. Remove the catch-and-release only regulation for Lake Sylvia south of Perryville and make the daily limit of largemouth bass five. Change the minimum length limit of paddlefish (sometimes called spoonbill catfish) taken by commercial fishing on the Mississippi River. Allow commercial take of aquatic turtles on private property. Prohibit commercial fishing on Old River Lake near Scott. Require detailed reports from commercial fishermen taking alligator gar.